One of the highest compliments - perhaps the highest compliment - you can pay a film is that one can learn from it all the secrets to making a great film. 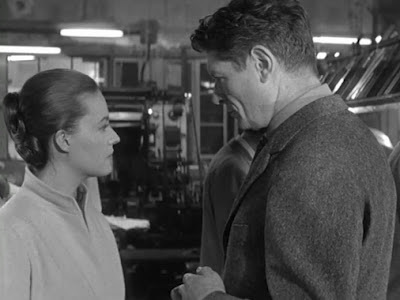 Louis Malle's The Lovers (1958) is such a film. Let's take a look at this shot about sixteen minutes into the film, in which Jeanne (Jeanne Moreau) visits her husband, Henri (Alain Cuny) at work, and becomes quickly suspicious of his relationship with his secretary (Malle's handling of this is very fine; nobody says what's really going on, but it's painfully apparent). 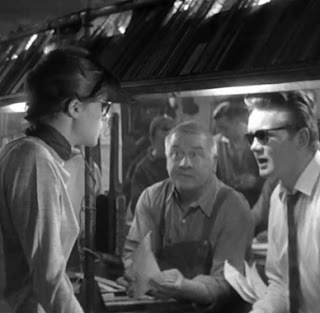 That's Jeanne at the far left, her husband in the center, and his secretary directly behind him. Not only does Malle get all the principle characters into the frame, but he blocks them in such a way that, even in old-fashioned 2-D, we can tell Jeanne is looking past her husband as they talk towards her real concern. That first one, by the way, is almost exactly 1.33:1, or classic full frame. This sense of combining two principle shots gives the frame a pleasing symmetry (accentuated by the actors' heights, which create a pyramid), while situating the protagonists in the foreground ensures our eyes will be drawn towards the most important action. Yet the secretary is not so far in the background that she's forgotten; she's just inside ours and Jeanne's eyeline, and from our perspective, she and Jeanne's husband are practically connected. Here's another shot, inside a mechanic whose help Jeanne seeks after her car breaks down. This is a different sort of blocking that is nonetheless economic in its storytelling and pleasing to the eye. It's another well-balanced frame, with its subjects operating at varying heights, and the truck hood weighing the frame just slightly to one side. But what's really notable about this comes from a more macro-structural standpoint. This is our introduction to the garage; there's no establishing shot or anything. It cuts from Jeanne getting a lift of the side of the road to this. But right away, we know exactly what's happening - we see two men reparing modes of transportation, and a broken-down car in the center of the frame unmistakably tells us where we are. Jeanne gets out of the car in the distant background and walks towards the shop, and we see her right away, why? Because she's in the center of the frame, dressed all in white, and the most brightly-lit element of the shot. She gains equal footing in the scene because of the lighting decisions made by Malle and his cinematographer (the great Henri Decaë). Finally, let's look at this shot that kicks off a dinner party. After Jeanne's car breaks down, she catches a ride from Bernard (Jean-Marc Bory), a stranger who happens to be on his way through her town. Upon dropping her off, he's instantly invited to dinner. He'd previously stated his purposeful distancing from the upper class by outright saying, "I avoid all those awful people" (his cousin runs in that crowd), but Malle both underlines that statement and deepens it with this shot. Jeanne and her society friends enter on the left, laughing and having a good time, while Bernard stands isolated at the right. His outsider status is well-established, but he positions it early and often as a choice, a way to stand apart. Here, Malle highlights the loneliness of that stance, suggesting that Bernard's attitude is a manufactured way to deal with his lot in life. Or not! As with a great many things in The Lovers, as much is said as unsaid.